I dragged a friend into the deepest reaches of District 1 while fighting off the afternoon heat sweat bath for the amazing grilled pork patty baguette at Banh Mi 37 (meal #97), and of course the pushcart and sidewalk grill were locked up tight for the holiday. No worries though as we schlepped this pile of sour lemons one block south to make some sweet lemonade so to speak at another sidewalk joint I had been itching to try. 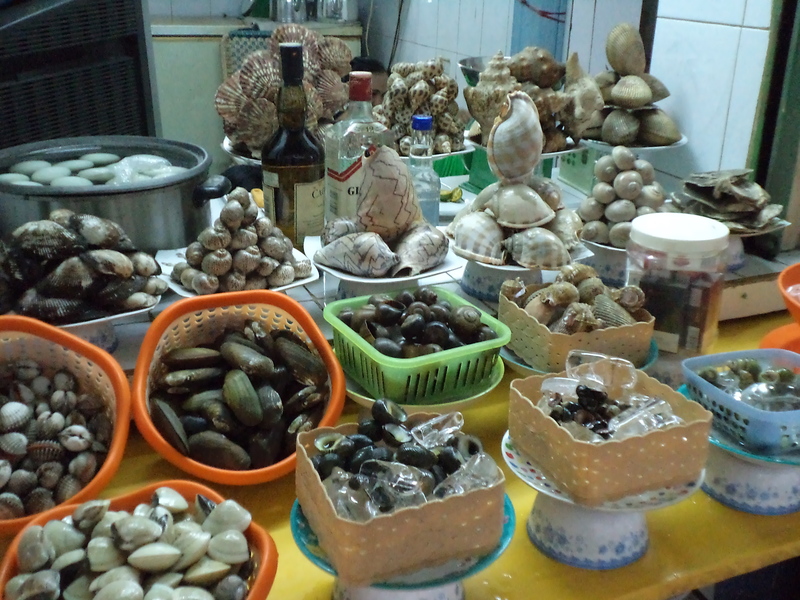 This restaurant called Quan Oc at 49B Nguyen Trai has various shells living out their final moments in artfully arranged display piles. To my untrained eyes it all just looks like it crawled out of a swamp, so where does one even begin when making a selection. Did my friend and I really believe that holding the laminated menu over the display would somehow enlighten us by osmosis as to what we were looking at? Luckily the friendly owner came to our rescue with sign language to match the incomprehensible menu names to various shells, snails and oysters though we still knew nothing about what we were about to order in terms of taste. For my dinner, I randomly settled on a rather innocuous looking but tongue twisting nghêu hấp xả và gừng for no compelling reason other than the woman gave me two thumbs up, smacked her lips loudly, and made a sucking noise with her tongue and teeth. Surely even in Vietnam these strange sounds mean something tasty shall burst forth from the wok. 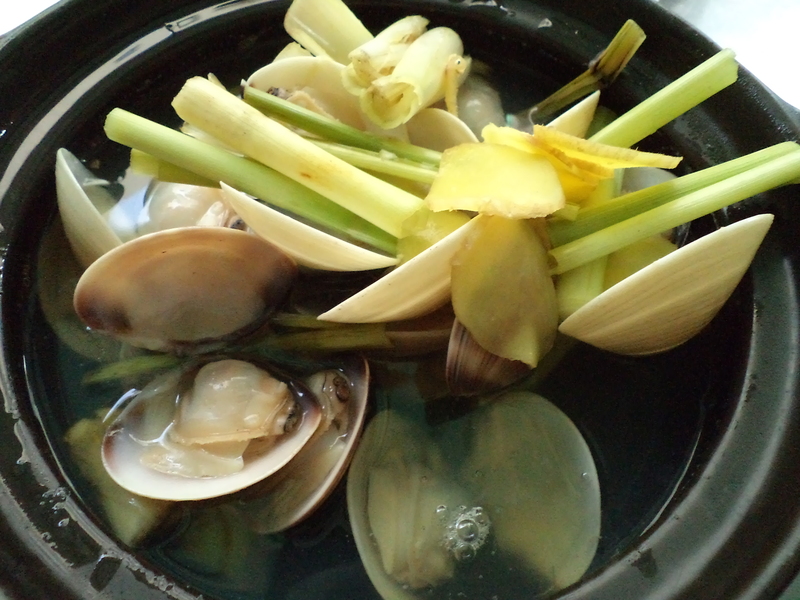 A large bowl of ginger and lemongrass infused broth arrived with a heap of clams marinating in all that richness. Once I began greedily picking them out of their hinged homes with a miniature two pronged fork barely bigger than a toothpick, that amazing food sweet spot washed all over me. Our mollusk guru had been quietly watching on the sidelines and came over to the table with great fanfare to school us on proper bivalve consumption. I soon realized I had downed the first four all wrong. I can’t believe a precious third of these tasty things fell victim to my ignorance of the standard protocol’s intricacies. The woman hovered just inches away all up in my business to ensure proper consumption of the remaining morsels. Her rapid fire Vietnamese instructions made no sense and everyone around us began laughing while looking our way. She finally just grabbed my hand, guided it towards the bowl, and in one fell swoop we had a shell in my now wet fingers. Then she once again maneuvered my hand towards the uncomfortably warm broth like some dive bomber to fill the shell with the fragrant water. We weren’t done yet though since a tiny bit of nuoc cham is added like a final pièce de résistance before the whole rubbery thing is sucked out of the shell in one delicious slurp. For just over $2 this dinner is a steal. And since tiny mussels aren’t too filling, this meal won’t break the calorie bank either.